When CleanMyMac X has done its job, you quit it. But, if you wish, you can keep its Menu active in the status bar. It’ll both inform you of critical changes in your Mac and provide useful features. The Menu icon appears in the Apple menu bar when you start CleanMyMac for the first time. So, you need to click the CleanMyMac Menu icon to access it. 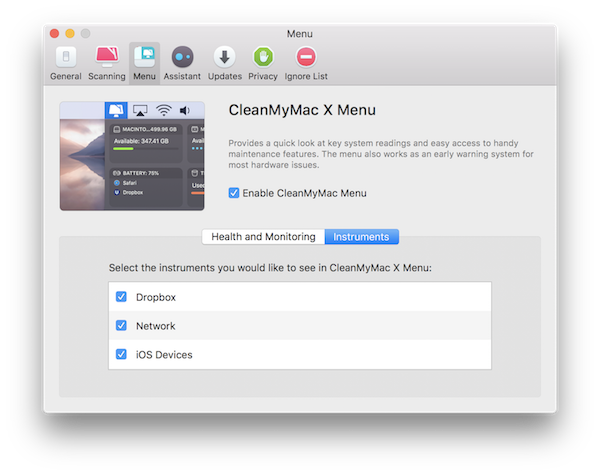 If the Menu is off, choose CleanMyMac X → Preferences → the Menu tab and choose the Enable CleanMyMac Menu checkbox. All internal drives are present as separate instruments in the Menu, each showing total capacity and free disk space. Click Free Up: the Menu will offer you to open CleanMyMac and start a new Smart Scan. 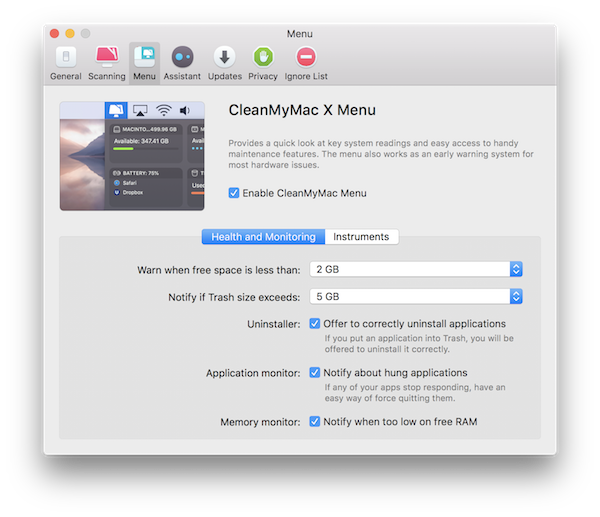 Set a threshold for the minimum free disk space in CleanMyMac X Preferences and receive a notification from the Menu when it’s reached. Click on a drive icon to open the drive in Finder. If your Mac experiences a performance drop, click Free Up in the Memory instrument. It’ll remove cached data from RAM to make way for more urgent processes. Get more: Receive notifications when your Mac is running out of RAM. Or, turn off these notifications on the Menu tab of CleanMyMac X Preferences. You can get rid of the junk in all Trash folders, both the system and external ones, with a single click on the Empty button in the Trash instrument. Get more: Set a threshold for the system Trash and get a cleanup reminder as soon as it’s reached. Now you can easily detect the apps extensively using your system resources, in particular, RAM, CPU, and battery. Just click the info-button in the upper-right corner of a corresponding instrument or, for the battery, look at the instrument. Click Quit next to a demanding app to shut it down. You can define how fast your Internet connection is by clicking Speed Test in the Network instrument. Then, try to click “Good for” to make sure the current speed suits your purposes (e.g., messaging, streaming, playing gaming). Check current upload and download traffic. Click the current traffic indexes to review total amount of data received since the uptime. 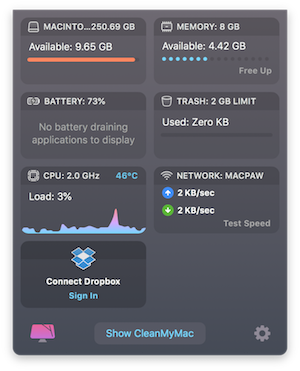 When you connect an iPhone or iPad to your Mac, the Menu shows it as a separate instrument with the storage and battery state details of the device. The Menu automatically shows the current level of available free space in your Dropbox if you're signed in with your Dropbox account. Open CleanMyMac X → Preferences → the Menu tab. Switch to the Instruments tab and deselect a checkbox next to an instrument you’d like to disable. To turn off CleanMyMac X Menu, go to CleanMyMac X → Preferences → the Menu tab. Then, deselect the Enable CleanMyMac Menu checkbox. If you have any feedback, please share it with us.